Round Two: 13 More rockets cause widespread damage, prompt Peres to question a $250 million check from Qatar. Hamas and other terrorist groups struck back in Round Two of Wednesday’s missile war, causing widespread property damage and prompting President Shimon Peres to question Tuesday’s $250 million check from the Qatari emir. As of 2 p.m. Israeli time Wednesday, southern Israeli residents were pounded with more than 70 mortar shells and rockets since the early morning. At least six people, two workers from Thailand and four Israelis, were seriously wounded, and dozens of others suffered shock. Property damage was widespread, with at least one home sustaining a direct hit. The explosion occurred several feet from a man and wife who were eating breakfast, but the angle of the rocket caused the shrapnel to fly in the opposite direction, sparing the couple from injuries. The rocket slammed through the empty bedroom of their daughter, who was in Jerusalem at the time. 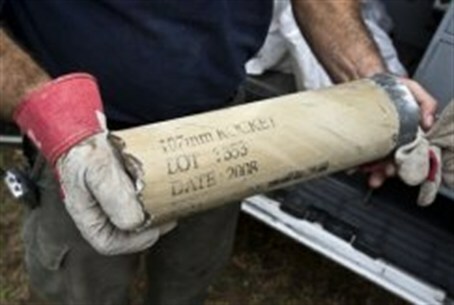 The Iron Dome anti-missile system intercepted seven rockets that were fired towards the southern port city of Ashkelon. The IDF continues to retaliate, but officers readily admit they cannot prevent a massive onslaught of rockets, unless the military carries out a large-scale operation and possibly a ground incursion of Gaza. Defense Minister Ehud Barak issued the usual warnings to Hamas that if it does not cease firing, it will bear the consequences. He did not spell out what measures would be taken, but ground invasions, such as that in the Operation Cast Lead operation four years ago, have been the only vehicle to curtail rocket attacks. After each withdrawal, the attacks resume, whether immediately or several weeks later, as has been the experience since the government expelled all Jews from Gaza and withdrew all military personnel in the summer of 2005. Wednesday’s attacks and counter–attacks were the largest surge in violence since June. The latest escalation began on Tuesday evening, shortly after the end of a high-profile visit to Gaza by the emir of Qatar, who was the first foreign leader to visit Gaza since Hamas ousted Fatah leaders from the area five years ago. The IDF’s retaliatory strikes on Wednesday killed at least one terrorist, the day after three others were struck down by aerial bombings. Throughout the morning, Israeli aircraft again raided northern Gaza, targeting a "terror tunnel" and other sites, as ground troops fired at "terror activity sites" -- in some cases with tank shells, an IDF statement said.